Kirkland Uncorked: where I’ll thrill to the grill. You coming? A grill’s gotta do what I grill’s gotta do, and I’ll be checking out the excitement at Kirkland Uncorked this weekend, where you’ll find me Saturday at 5 p.m. in the Tasting Garden, emceeing the annual grill-off at the Weber Grill Stage. With beautiful Lake Washington as a backdrop, I’ll join Pat Donahue (executive chef Anthony’s Restaurants), Wylie Frank (sous-chef at Lark, co-owner of Shophouse) and Jacob Nyman (executive chef Coho Cafe) as they race against the clock to wow a trio of judges. Judging the wow-factor are Q13’s Brien Blakely, Seattle Weekly editor Mike Seely and Frantic Foodie Keren Brown. Come cheer them on! Tasting Garden admission is $25 in advance or $30 at the entrance. Tickets include a commemorative tasting glass (while supplies last) and 10 wine-tasting tokens. One ounce wine tastes are 1-2 tasting tokens depending on each wine’s value. Bring ID — you must be 21 or older to enter the Tasting Garden. Advance tickets are non-refundable for this rain-or-shine event. Non-tasting admission is available for $15. 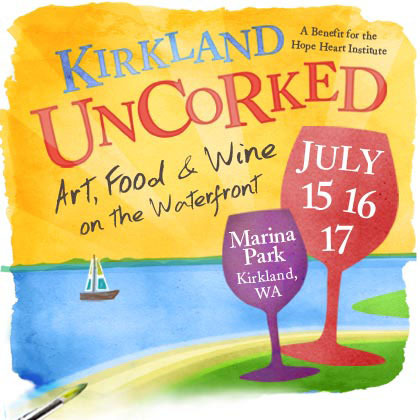 Find Kirkland Uncorked’s complete events schedule here.